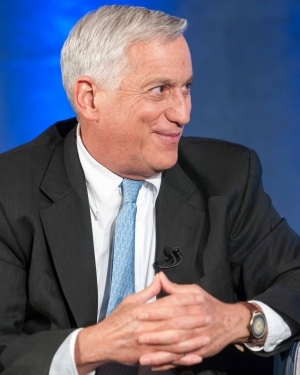 Walter Isaacson  at "The Kalb Report"
The late Steve Jobs may have created the technology that will revive the news business, his biographer, Walter Isaacson, told host Marvin Kalb on the latest edition of “The Kalb Report” at the National Press Club March 20. Jobs' creation of the iPad offers is a new way of distributing news, Isaacson said. And the creation of apps, he added, provides a new way to sell news to subscribers, which will bring new revenue to journalism. The app, he said, allows for “enormous creativity” and provides a good business model. Isaacson, who had been managing editor of Time  magazine and president and CEO of CNN, is the author of the best-selling biography of the quirky genius who founded Apple, Inc. and transformed the high-tech industry. In a wide-ranging one-on-one interview with Kalb, Isaacson described his extraordinary experience of interviewing Jobs at least 40 times to write the biography that came out about the same time as Jobs’ death. Jobs, he said, “is the creation myth of our time writ large. "He created something in his garage with his friend from down the street that became an industry-changing corporation. Jobs had a roughness, petulance and impatience that could be so annoying that he was fired from his own corporation. Yet he inspired a cadre of loyal employees who saw his genius in his roughness that demanded perfection. Isaacson described how Jobs transformed the music industry by creating iTunes that allow people to buy songs off the Internet for 99 cents and play them on their iPods. He found that people would be willing to pay for Internet content if the price were right and the payment system easy. That same concept will apply to the news industry, Isaacson said. If there were an easier payment system – and news was not given away free on the Internet -- people would be just as willing to pay for good journalism. Yet the news business is having a hard time innovating while still providing a daily product, he said. The app may be the answer. In the first year after Jobs introduced the app, he said, it generated $2 billion in revenue. An entire industry was born instantaneously. The interview with Isaacson was the 75th show of “The Kalb Report” series launched in 1994. It is underwritten by a grant from the Ethics and Excellence in Journalism Foundation.